Things are getting' really serious here with Bolt Thrower. The fans had to wait for 3 long years since Mercenary, but for sure it was worth it. This cd is maybe one of the best in its genre in 2001. Hey the band exists since 15 years so we are not talking about beginners. First the cover is great with this barmy warriors fighting scene. It represents the intensity of this opus dedicated to the darkest death metal. The production is fantastic as it adds to the violence of the band a big sound that is just smashing into your face. The only band which could be compared to this kind of brutality would be Pro-Pain. But for sure a bit more violent and obscure with a much deeper voice, Benediction's ex singer Dave Ingram joined the band. Honour - Valour- Pride is a very mature album from a mature band. The killing production just fits to the killing songs and for sure the killing cover. The riffs are intense and the rhythmic section is very heavy. The vocal are very deep down and slow, maybe not very varied, but it gives to the whole album its insane ambiance. There is a vicious effort sustained during the hole album to keep the things very low and brutal. Once you get into this stuff believe me it won't let you go just like that. This is going to be quite a thing to see the band live playing all these white-hot heated songs just like bullets. The crowd will go crazy into a moshpit from hell. In life, the band continues its no compromise ideals by managing itself, booking its own tour and even printing its own merchandise. 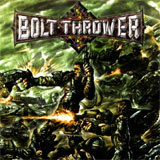 Bolt Thrower is a war machine and Honour - Valour- Pride (I like this tittle) is a silver bullet to the sun. So for sure, this one deserves proudly to be album of the month !!! !